I know it’s late, but I just couldn’t go to bed without posting this drink! I am so excited – Christmas in a martini glass! After a long afternoon of mixing, rolling, cutting and baking gingerbread dough, my girls thought it would be nice to sit together to watch a Christmas movie. I thought that was a super idea, so I promptly began working on snacks and drinks for some good television viewing. I heated 6 cups of organic apple cider on the stove and added some sliced ginger root (2 tablespoons), 2 cinnamon sticks, mandarin zest (a little tricky – I had no oranges! ), fresh lemon juice (1 teaspoon) and 1 teaspoon of agave syrup. My one daughter has been fighting a cold all week and I am very determined to keep her healthy for the holidays, so the ginger root was added to boost her immune system. I let this spiced cider simmer for about 30 minutes while I whipped up some guacamole. I decided on something extra special for us adults. I cooled 2 cups of the cider in a glass pitcher with a few bits of ice. I then added 1 cup of coconut water and 2 cups of chilled sake. In a small bowl, I mixed together 1/2 cup of coconut sugar and 1 tablespoon of cinnamon (the extra will be used in tomorrow’s baking). Using an open mandarin slice, I rubbed the rim of a couple of martini glasses then dipped each in the bowl of coconut sugar and cinnamon. I filled our glasses with the cider and sake and my gingerbread cocktail was born! What is sake? Sake is an alcoholic beverage originating from Japan. Made from fermented rice, sake is natural and so rich in amino acids. It is not distilled and it is not processed. Check out these sites to learn more about sake and its health benefits http://www.learnaboutsake.com/2009/05/health-benefits-of-sake.html and http://www.sake-world.com/html/sake-faqs.html . If you are in the mood for a cocktail, I suggest you try some Japanese sake. It pairs so well with a variety of fruit juices. Need some recipes? Take a look at Sarma Melngailis’ sake cocktails in her books, “Living Raw Food” and “Raw Food real world”. Cheers! This entry was posted in Beverages and tagged apple cider, Christmas beverage, cinnamon, cocktail, drink, ginger, health, sake on December 16, 2012 by uberdish. If you are planning a trip to the grocery store this morning, be sure to put sweet potatoes, a can of organic coconut milk, garlic and some fresh ginger on your list. Perfect for a cool, wet evening, this soup has remained at the top of my comfort food list for years. It is so rich and smooth and it makes you want to melt with each spoonful. Guaranteed – this will be the best Sweet Potato Soup you have ever had! The first thing you need to do is make a sweet potato puree and I really do suggest that you make your own. Once, when time was an issue, I decided to use a can of sweet potato and it wasn’t the same. You can set aside any left over puree (minus the spices, milk and butter) for future baking. I reserved 1 cup of mashed sweet potato for some drop biscuits that I made later in the day. Preheat oven to 400 degrees Fahrenheit (200 degrees Celsius.). Prick potatoes a few times with a fork. Place whole, unpeeled potatoes on a baking sheet. Bake for 30 minutes. Place whole, unpeeled garlic cloves on the baking sheet and continue to bake until potatoes and garlic are tender (about 15 minutes). At this point, curious family members will rush from various rooms in the house in anticipation of their next meal! When potatoes are cool, peel skins and place in a food processor or large saucepan. Mash until smooth, then remove 1 cup to set aside for baking. Add garlic, milk, butter and seasonings to the mashed potatoes and stir. Melt coconut oil in a large saucepan over medium heat. Add the onion and ginger and cook, stirring occasionally for about 3 minutes. When onions and ginger are nearly soft, stir in curry, cumin, and coriander. Cook until fragrant, about 1 minute. 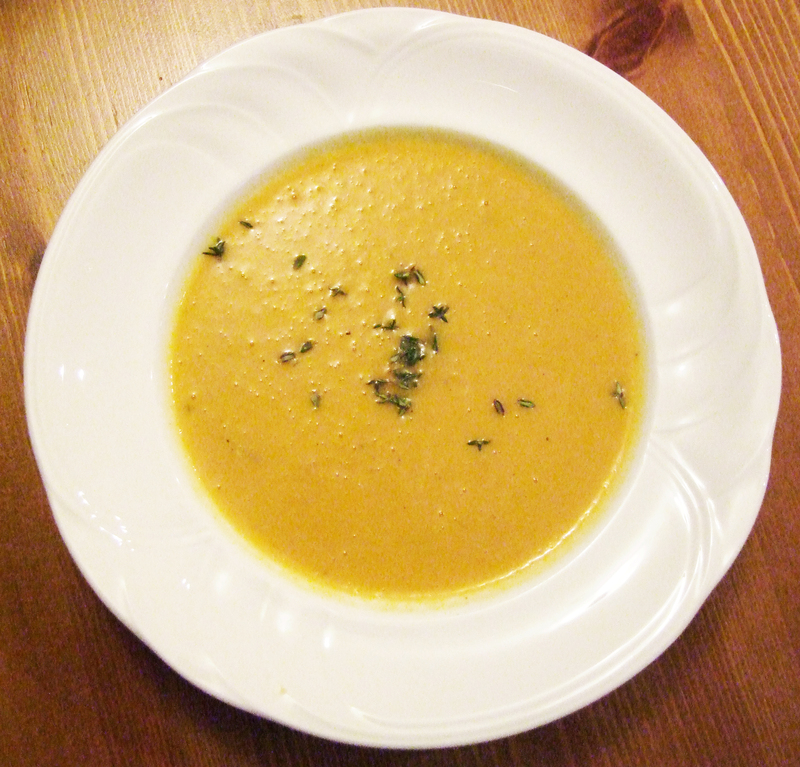 Whisk in Sweet Potato Puree, pear, coconut milk, and vegetable broth. Increase heat to medium-high, then reduce heat, cover and simmer for about 10 minutes. Puree in a food processor or with a hand-held mixer until smooth. (For 13 years, I have owned a Bamix hand-held mixer that is perfect for soups – easier clean up and faster to the dinner table!). Stir in lemon juice and add sea salt to taste. Garnish, if you wish. Enjoy! Sweet potatoes are a complex carbohydrate rich in fiber, beta-carotene, vitamin C, vitamin B6, manganese and potassium. In fact, sweet potatoes contain one half of our daily vitamin C requirement! This entry was posted in Soups and Salads and tagged coconut milk, coriander, cumin, curry, food, ginger, recipes, soup, sweet potato on October 28, 2012 by uberdish.